Lanterns are perfect for transforming a living space inside or out. Use them to create atmosphere and mood. I am currently re-styling my courtyard garden and I am planning to fill it with lanterns in the summer especially when I have guests. Even if it is too cold to sit outside they look beautiful through the windows. 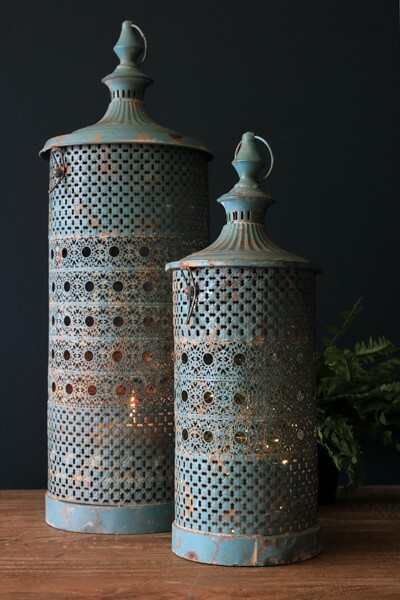 The Rhiad Blue Lanterns are for use indoor and outside, but we would not recommend leaving them outside overnight or in bad weather as they will not survive! Take them inside and create a romantic mood inside too. Dimensions 19cm diameter x 50cm high and 24cm diameter x 68cm.